It's June and my beloved Wimbledon tennis starts on Monday. Therefore it is officially strawberry season. We planted a few strawberry plants a couple of years ago and they were supplemented last year with some free ones from a newspaper offer. According to the all the gardening books I have it says you pin down the runners from the plants after fruiting and then re-plant them. I have just left them to run wild but the strawberry plot is contained by wooden planks so the whole garden hasn't been taken over. When we first moved here there were several pick-your-your strawberry fields we used to go to. Once June arrived we would start looking out for the signs strapped to lamp posts to say it was picking time. One of fields was particularly delightful. Due to its size as a large soft fruit and vegetable farm you often got to ride on the trailer pulled by the tractor to get to the far fields. Over the years all of them have closed down. The last one closed after customers were eating more than they buying and people raiding the site at night. The owners ended up living in a caravan next to the field in order to guard it. The rain that was the summer of 2012 meant a crop failure and it washed away any fairweather customers. My daily pickings are now supplemented by supermarket offerings. I only buy British strawberries. Nothing beats their dark red coating or how their soft interior makes it hard not to eat one without the sweet juice running out of your mouth. It's a seasonal treat and should remain so. I couldn't let my bottle of elderflower cordial be quaffed without me using it for other purposes. For the full on seasonal experience I added some to the cream. The mint in the strawberry mixture grows in a pot in my garden. It's a Lime Mint plant I bought at the garden centre at RHS Wisley last year. I never took it in over the winter but the mild weather has been kind to it. It's not such a rampant grower as garden mint but still best restricted to a pot. Use whatever fresh mint you prefer. This is also going to Tina at The Spicy Pear who is hosting Four Seasons Food this month on behalf of Louisa at Eat your veg and Anneli at Delicieux. This month's theme is Red. With strawberries, mint and elderflower cordial, which I saw being bottled myself, this is also going to Ren at Ren Behan for June's Simple and in Season. Weekly blogging events are Recipe of the Week with Emily at A Mummy Too. 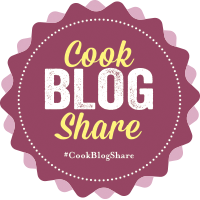 Also Lucy with Cook Blog Share at Supergolden Bakes. 2. On the baking parchment draw round the dinner plate leaving space around it. Don't cut out the circle but instead leave space all around. Place on the baking tray. 3. In a large bowl put the egg whites and whisk until stiff and won't slide out of the bowl. 4. Keep the whisk going and gradually add the caster sugar. 5. Mix together the cornflour and white wine vinegar. Beat into the mixture. 6. Make the meringue nest either by spooning the meringue around the edge of the circle and building it up before adding some in the middle. Alternatively spoon it all into the middle and then push out to the sides of the circle. 7. Reduce the oven temperature to 150°C/Gas mark 2 and then cook for 1 hour. 8. The meringue should have a light brown colour to it and hard to the touch. Turn off the oven and leave it to cool in it. 9. While it is cooling make the strawberry filling by putting the strawberries, caster sugar, mint and vanilla extract in a bowl and gently mixing together. Put to one side. 10. Once the meringue has cooled peel off the baking parchment and put on a serving plate. 11. Whisk the double cream until thick and keep whisking while you pour in the elderflower cordial. 12. Pile the strawberries on top. Be careful as the syrup is prone to running down the side. Further suggestions: Go through the soft fruit season by trying this with raspberries, red currants and finally blackberries. Oh. This looks so delicious. There's nothing like the taste of English strawberries. The imported ones might be bigger, but they don't have the flavor and sweetness of our home grown fruit. Visiting from UK Bloggers. Bigger isn't always better! I love how special it makes them to eat them just at this time of year. I took a risk with the weather when I made it and was rewarded with some evening sunshine. I need a bit more sun though to ripen up the rest of the patch. It would be perfect for those late night Andy Murray rollercoaster matches! Wow, I really like strawberries, especially English one. You also tried a nice combination of mint and strawberries. It works well. I have a hunt around the garden looking at what herbs I think would go with my recipes.